The Milky Way analog galaxy, NGC 891. Overlaid are color curves that show the flares from groups of stars with similar ages. When all stars are put together, the disk has constant thickness, shown by the straight white lines. 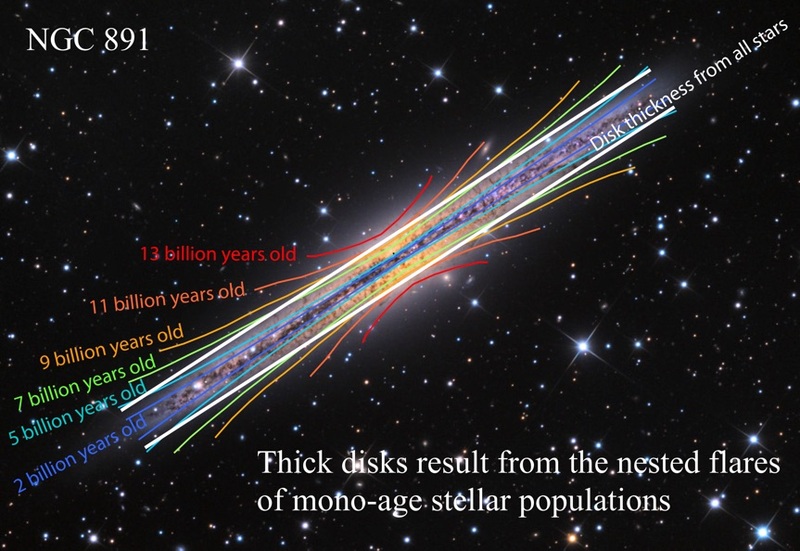 Mono-age groups of stars always flare (increase thickens with galactic radius), unless just born. The primary reason for that is the dynamical effect of infalling satellites throughout the disk lifetime. However, if the disk forms inside-out, then older populations dominate in the inner disk and younger ones in the outer disk. Therefore, when the total stellar population (all ages) is decomposed into thin + thick disks, the flaring disappears (or is strongly reduced)! 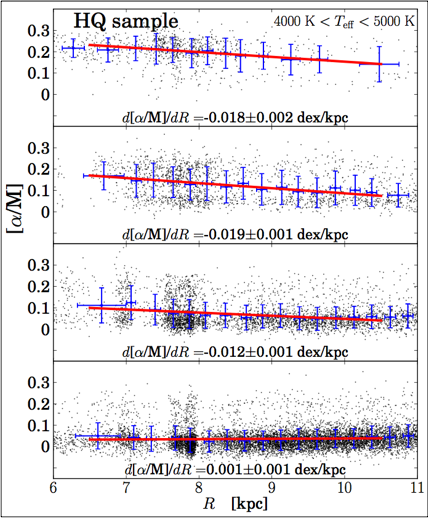 Since [α/Fe] (or [α/M]) is a proxy for age, the decline of [α/Fe] with distance from the Galactic center seen in APOGEE data (as well as RAVE - Boeche et al. 2013, and SEGUE - Cheng et al. 2012) is equivalent to a decline in mean stellar age. The only explanation for this phenomenon is the flaring of mono-age populations. NGC 4762 - a disk galaxy with a bright thick disk (Tsikoudi 1980). 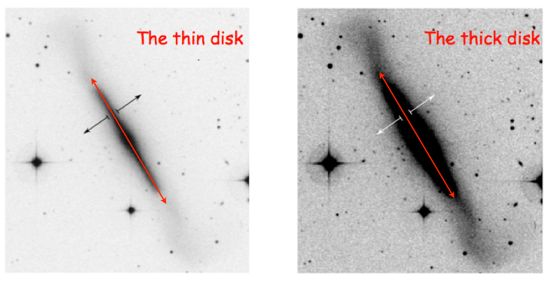 Deeper exposure reveals a thicker disk component, as extended as the thin one. Red line has the same length in both panels. 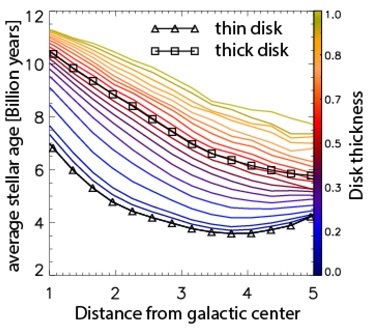 This apparent discrepancy between our Galaxy and external galaxies is related to the different definition of thick disks - morphological decomposition in external galaxies and separation by chemistry in the Milky Way. 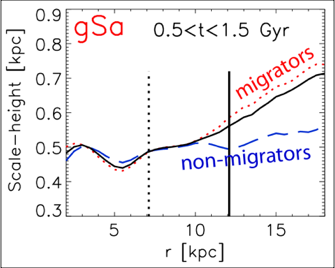 Allowing for an age gradient (decline in mean age with distance from the galactic center) due to the flaring of mono-age populations resolves this issue. 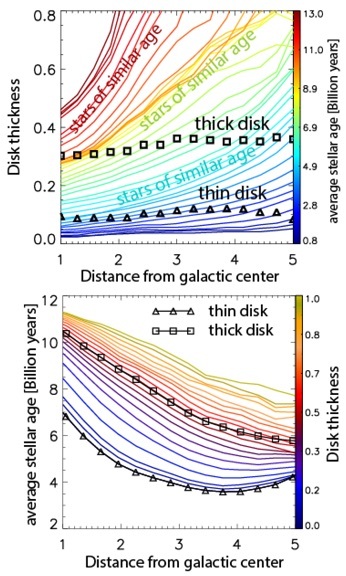 Decline of mean [α/Fe] high above the disk plane (in the thick disk regime) is already seen in our Galaxy (see below). We are currently investigating this in observations of external galaxies. 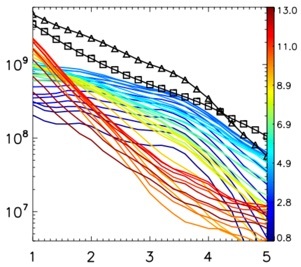 Disk flaring always found in simulations, but not in observations of external galaxies. While flaring cannot be avoided in a mono-age population, the thickness of the total stellar population (stars of all ages) can be constant with radius if disks form inside-out. In this view the thick disk is composed of the nested flares of the mono-age populations. Indeed, flaring of younger stellar populations in the Milky Way have been reported in several works (e.g., Feast et al. 2014; Kalberla et al. 2014; Carraro et al. 2015). Most recently our predictions have been confirmed by the results of Bovy et al. (2015), who reported flaring in mono-abundance populations in APOGEE data, although it is unclear if the highest [α/Fe] populations flare, which may be due to the very small number statistics there. Disk surface density radial profiles of mono-age populations. Older disks (red curves) are more centrally concentrated, which explains why flaring diminishes in the total population. 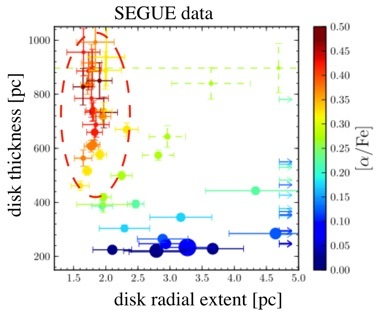 Also shown are the surface density profiles of stars close to (triangles) and high above (squares) the disk midplane. The thick disk defined morphologically this way extends farther out than the thin one, just as seen in external galaxies. Click here to see how radial migration affects the disk thickness. 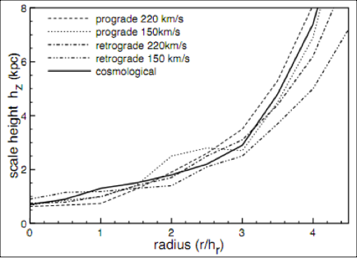 Click here to see how radial migration can be linked to a chemo-kinematic relation in the Milky Way.